Warid is the one of the biggest telecommunication of Pakistan who is providing telecommunication service from last many years in this Country. All the subscribers of Warid are really satisfied and relax by using this telecommunication services. Now this company is introducing online facility to all his valued customers all over in Pakistan. The name of offer is “Warid Sign in” this is an exciting feature to all his subscribers because users can get full check & balance about his SIM card without any issue yes this is really possible now from this telecom. This telecommunication made a life easy of his valued customers and users can collect all the information & details of his account by using that feature. We must inform you this is online service and users can use that through internet facility, in past this feature is only for postpaid customers of Warid but from now this telecommunication has updated and now this service is eligible also for prepaid customers of Warid. Now users are thinking this offer charges will be really high for customers not at all users can use this exceptional facility with free of charge. Customers can easily get phone records, MMS histories and SMS details of a week without any issue by using this feature. This facility also provides five friends and family numbers (FNF) options to users. Subscriber can add, modify or remove any friends and family (FNF) numbers from that service. Customers also get news of latest packages and tariffs of this telecommunication and they can activate and re-subscribe any offer for using. We can say this is complete information platform for mobile users of this telecommunication all the details can easily collect from this feature. You click on Member area option then one more tab will be launched. Now you can find an option Create profile click on it. Then you will see a tab of write a phone number. Enter your valid phone number of this telecommunication. Subscribers will receive activation code SMS on his sim card. Enter your received activation code on website. Now your sign in of Warid has been completed with successfully. You can enjoy this phenomenal feature without any issue. Congratulations. If users have forgotten his password so they can change from this website. Customers also need how we can operate Warid Sign in Service after logging so it’s really simple for users. 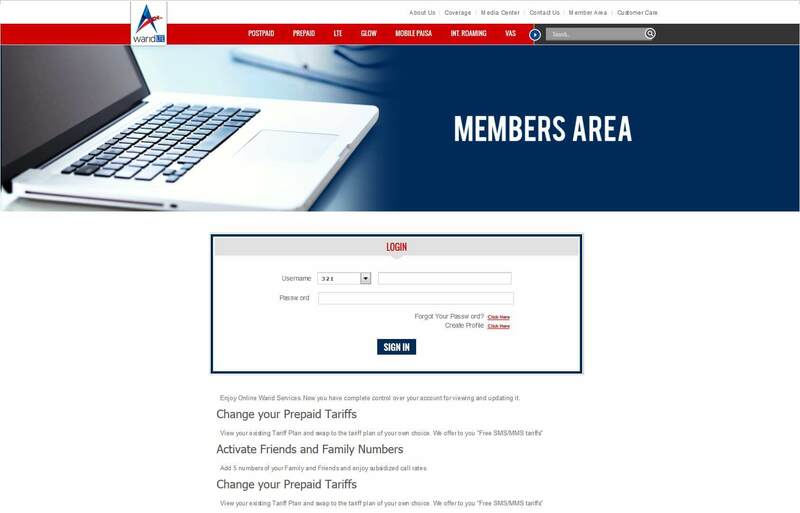 Visit on Member area page. After registration you can go on call history tab for checking details of call histories. All the options are available and subscribers can easily find options of packages, call records, MMS and SMS records, FNF and many other.